Brace for Impact! társasjáték - Magyarország társasjáték keresője! A társasjáték érték! A Brace for Impact! egy remek társasjáték, 2 játékos részére, az átlagos játékidő rövid, csak 3 - 5 perc. A társast, 12 éves kortól ajánljuk kipróbálni. A játékmenet erősen épít a kockadobás mechanizmusra. Brace for Impact! is a 2-Player micro dice game that requires lightning-quick decisions, dexterity and stamina. As a Naval Submarine Commander your mission is to either gather enough vital intel or destroy your enemy’s crew before your enemy beats you to it. Each Commander controls two dice and a meeple crew aboard a submarine equipped with torpedoes. Surface and dive, load and fire torpedoes and manage your crew to become victorious. Do you have what it takes to win? 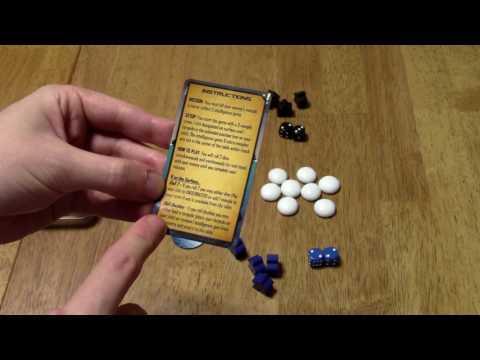 THE SETUP: Prepare for your epic battle by separating the black and blue game pieces. Each player receives two dice, 1 chit, 1 torpedo, and 3 Meeples of their color. The 8 intelligence gems and extra meeples are set off to the side within reach of both players. ON THE SURFACE: 7's on the surface allow you to dive underwater OR add 1 crew member. Doubles on the surface allow you to load your torpedo OR drop depth charges to remove 1 of your rival's gathered intelligence gems. UNDERWATER: 7's underwater allow you to return to the surface OR gather 1 intelligence gem. Doubles underwater allow you to load your Torpedo OR fire your torpedo (if loaded) to remove 1 of your rival's crew members. Play continues until a player loses their entire crew or gathers 5 intelligence gems! 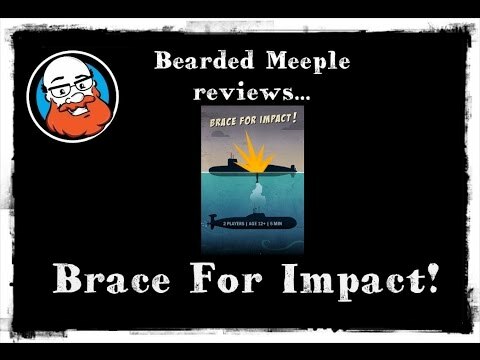 Bearded Meeple reviews : Brace for Impact! DGA Previews: Brace For Impact!